Only a couple more weeks of freedom an then it's back to the books! Wow! I love love love the chair! Perfect shade of purple! Oooh see I love purple. Although I could never pull off a purple living room because of the man. 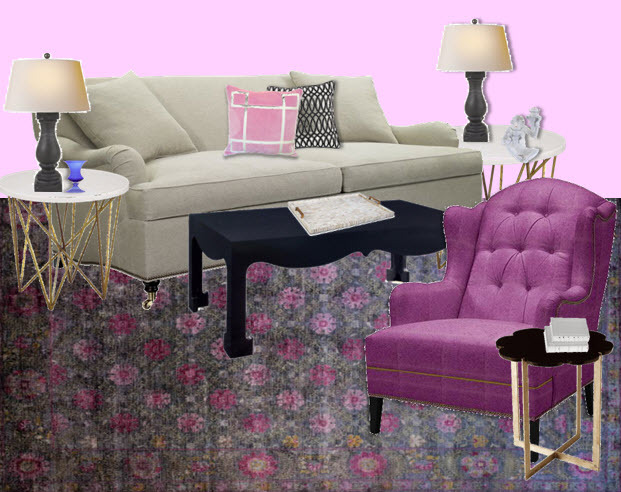 But this would be the perfect living room for a bachelorette! ooh lala...i love purple!! I think you did marvelous! I'm loving lilac tones right now -- this is such a cute room! i just stumbled onto your blog this morning and i love it so far! I like the inspiration board you have .....what program did you use to create your inspiration board? Loving all the collages you've been doing lately - they look great! What program are you using?